Thanks to Isaac for the tip off. 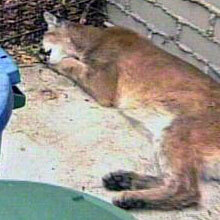 CBS2 News is reporting that a mountain lion was tranquilized and removed from a yard near Pine Street and Fair Oaks. According to CBS, sheriff's Sgt. M. Jacobs said that Edison Elementary School was locked down as a precaution. The story and pictures are showing up on national outlets like CNN and Rueters. Also LA Times has a good picture of the cat getting an ear tag. 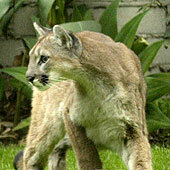 Pasadena Star News came out with the story and a great slide show.